Of all the questions I receive regarding the Easyboot Glove Back Country, this one seems to be the most frequently asked and the most challenging to answer. The Easyboot Glove Back Country and the Easyboot Glove utilize the same size chart, however customers may want to consider sizing up for the Back Country. It is a difficult concept to grasp but even though the boot shell size is the same, there are some reasons why you may want to select a larger size for the Back Country. Easyboot Glove size 1 and Easyboot Glove Back Country size 1.5. 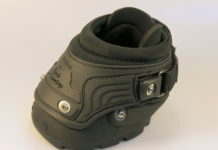 The Easyboot Glove requires a very precise fit and needs to be snug enough that the front V expands. 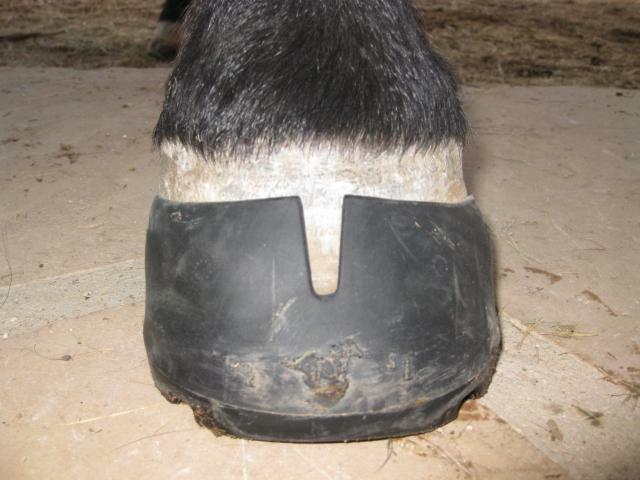 Success with the Glove often requires using a rubber mallet or an alternative method to ensure the boot is fully seated on the hoof before riding out. It also entails frequent maintenance trimming. 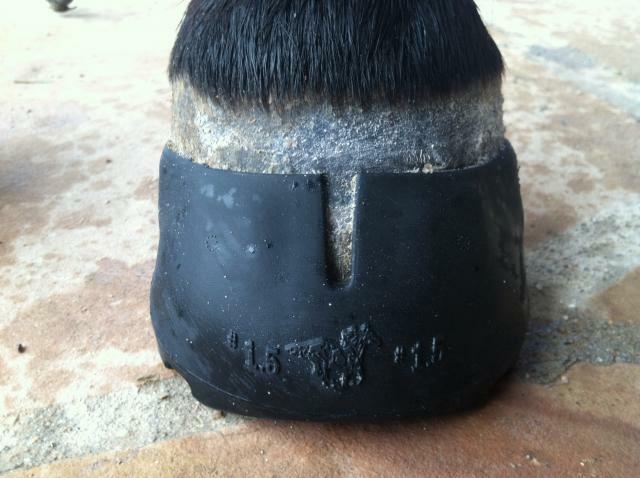 The Glove has proved to be a very successful boot and was even awarded Horse Journal’s product of the year in 2011. 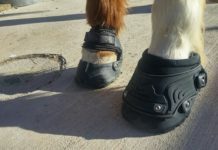 Despite this success, there were customers who were unable to use the Glove due to length of trim cycle, lack of hand strength or hoof conformation that would not yield a snug fit. The Easyboot Glove Back Country looked to the Easyboot Trail for inspiration to tackle these challenges. Size 1 – the V expands and the result is a nice snug fit. Cal wears this size for the Easyboot Glove. 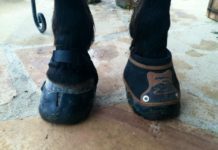 Unlike the precise fit required for the Easyboot Glove, the Easyboot Glove Back Country will still work on horses where the fit is not “perfect”. The Back Country’s Cordura upper stabilizes the boot on the hoof and allows for flexibility in sizing. This unique upper features a front plate that is essentially an integrated power strap – which means unless you are currently using power straps on your Gloves, the Back Country will have a slightly snugger fit than the same size in the Glove. One reason you may choose to increase boot size is to accommodate this feature. 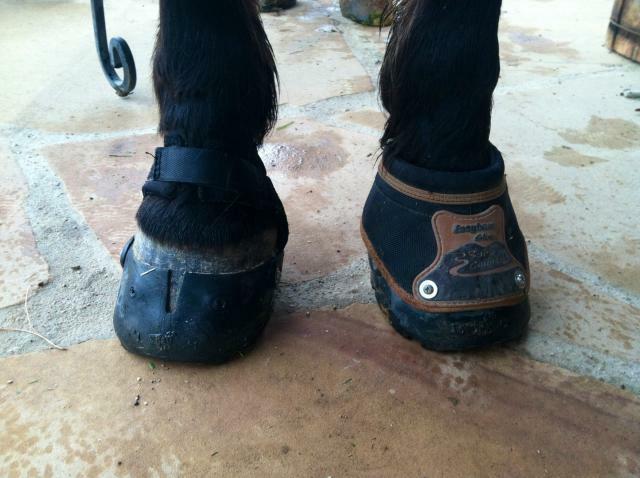 Since my horse Cal has a very snug fit in the size 1 Glove, I chose to use the size 1.5 for the Back Country. Some other reasons you may choose to size up are for ease of application or to accommodate a 6-8 week trim cycle. to twist the boot. Cal wears this size for the Easyboot Glove Back Country. To summarize: if you currently use the Easyboot Glove and have a snug fit without power straps, you can size up and eliminate the need for a rubber mallet, making application easier. If you need power straps and/or the fit is not very snug with your Gloves, then staying with the same size for the Back Country makes sense. If you do not have previous experience with the Easyboot Glove, we recommend getting a Fit Kit to ensure you select the proper size. Please contact us with any questions or concerns regarding fit and one of our customer service representatives will be happy to help you.